Mpeg 4 Audio How to mixdown to WAV file? I want to Mixdown to a Wav file? When I click on Export file to WAV it “Failed” to carry out? Can I do this in Shotcut? 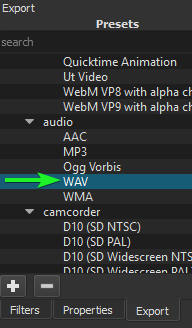 I think on saving I type “Wav” at the end and it exports it as a WAV file? Well it created a .wav file but this is not recognized as a .wav file by levelator2? Just use the WAV audio preset. Fantastic it worked your way…did not realize I could do that …thankyou so much!